Create 360 Virtual Tour with Easypano Tourweaver! What is 360 virtual tour? 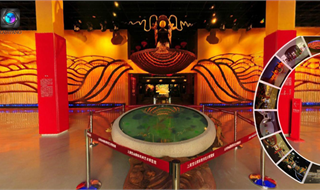 VR tour creating software - Tourweaver is widely used to build Flash 360 panoramic tours. It is most popular among real estate agents, panoramic photographers, website designing companies, multimedia designers and corporations. Click following image to see a real estate virtual tour with Google Maps, multiple 360 degree panoramas, popup windows, Flash components, floor-plans/maps, and hotspots. Click the image below to view this sample tour of a traditional art museum. More sample 360 tours created with Tourweaver. How to make a 360 virtual tour like the above? To make a 360 degree panoramic tour, first take 360 panoramas. Either take standard digital photos or fisheye photos to stitch into 360 panoramas with Panoweaver. One-shot lens can also be used to take 360 photo, check panoramic photography. Tourweaver offers various templates, so just add the 360 panoramas in your tour project and a VR tour is created automatically. If you want to use your own design, just choose a blank template and use your own background image, buttons and etc. on the mainwindow. How to upload 360 virtual tour? Simply upload all the published tour files to your web server and find the *.html file to open the tour. Or use embed codes in the index.html file to embed the tour in your webpage. You may also uploade your tour to EP-Sky and embed the tour to your blog or website.